Today, it’s becoming harder and harder to capture the attention of the modern customer. Retargeting is one of the only strategies that allows brands to stay top of mind with website visitors. To help marketers gain a better understanding of today's retargeting landscape, here are six key statistics to keep in mind. The popularity of retargeting is rapidly expanding as it allows you to re-engage with your visitors and gives you opportunities to provide value by delivering personalized, relevant content. That’s why it is no surprise that over two-thirds (64.3 percent) of brands are increasing their spend on retargeted search advertising, according to eMarketer. The mobile phone has transformed the world. We are now connected like never before with smart phones becoming our main gateway to the internet and the world. Therefore, it is no surprise that 54 percent of marketers are currently retargeting on mobile according to research by AdRoll. 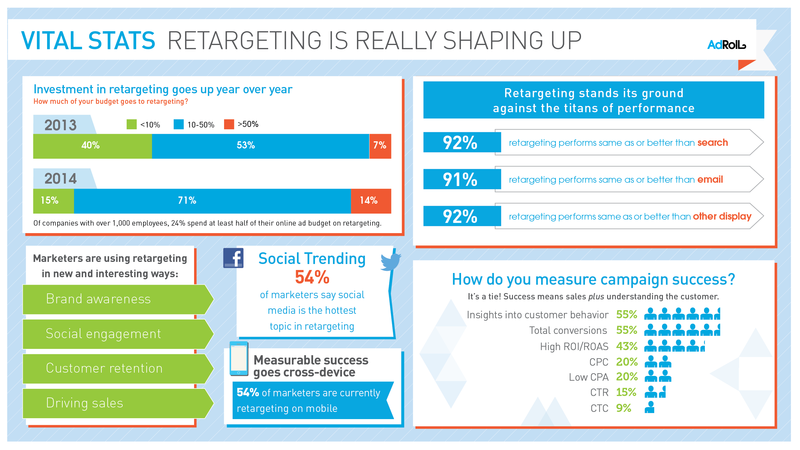 Social media retargeting is coming of age and yielding impressive results. According to research by AdRoll, adding Facebook to existing display retargeting campaigns resulted in 92 percent more impressions, a 9 percent drop in cost per thousand impressions and a 27 percent fall in CPC. As with any marketing initiative, digital marketers are bound to encounter some roadblocks. Research from iperceptions showed that retargeting overspending can be an issue, with 56 percent of customers who are retargeted after visiting the cart don’t have the intent to make an immediate purchase. This leads to companies investing in bringing visitors back to the cart when they didn’t have the intent to buy. Another challenge with retargeting is that brands may miss opportunities by failing to retarget at the right time with the right content. According to iperceptions research, over two-thirds (67 percent) of visitors who intend to make a purchase never make it to the checkout cart, suggesting that marketers fail to create campaigns that are tailored to visitor intent. One key strategy that can help brands coordinate more effective retargeting strategies that are aligned to visitor intent is by leveraging first party data such as customer feedback and CRM data. First-party data is instrumental in creating relevant retargeting campaigns and is critical for the future of marketing mainly because no competitor can access it. It’s completely proprietary. Econsultancy research found 68 percent of organizations now leverage first-party data to enhance their ad campaigns. Retargeting is an incredibly powerful tool and should be an essential part of any digital marketers’ toolkit and, as you look to optimize your retargeting campaigns, make sure your campaigns are targeted, relevant and personalized to the needs of your visitors.